For more than a century, this lovely two-story Queen Anne style home has graced the northwest corner of 13th and Center. Mary (Seaman) Ennis purchased three lots on the site in December 1906 and contracted with Fred Hunt for a house. Hunt married Lyda Seaman (PDF) May 1, 1907, in Denver. After they returned home, the couple moved into the house along with her sister, Mrs. Ennis. The three continued to live in the home until 1917. The Seaman sisters did millinery (women’s hat making) work. Their shop was known for the “elegance and intricacy of its designs” (PDF). The sewing room upstairs pays tribute to the Seaman sisters’ work. Look for the package of fabric still in its Millisack’s store wrapper. In 1917, Mrs. Ennis sold the house to James P. Cullen. After Mrs. Ennis moved, Cullen turned the home into a boarding house. He rented furnished rooms to single gentlemen or married couples. In 1930, Emily A. Stewart bought the house. She kept the house for only three years, then selling it to Sherman County Treasurer Roy Heston. Heston turned it into his home. His daughters Gloria and Twila Heston’s room is now called the Children’s Room. 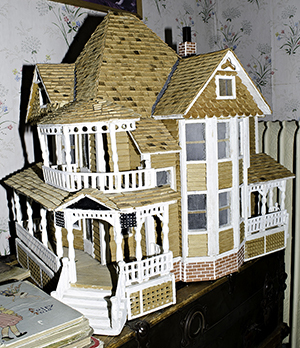 In that room, see the model of the house that Ken Yoke built. In 1939, the Hestons moved two blocks north to care for Heston’s father-in-law. The Hestons then rented the house to Bower Funeral Home. The Bowers held funerals on the first floor (PDF). The mourners sat in the house’s living room. In the living room, look for the charioteer on the chandelier and find a tissue box cover that looks like an Easter Island sculpture. The dining room held the caskets. They bracketed the caskets with floor lamps and kept the shades open so people could walk by and see them. They also owned Bower Furniture at 13th and Main. The Bowers bought the home in 1944. Finally, in 1956, Hope (Bower) Littlejohn sold the home to Calvin T. Handy. Calvin T. Handy, who owned Handy Chevrolet, bought the house Oct. 6, 1956. The Handy family retained the house until Edythe Handy died in August 2000. Some say the house is haunted (PDF). 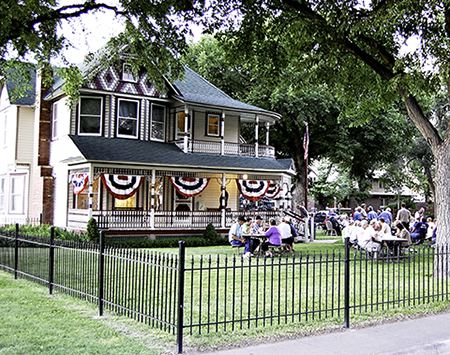 Sherman County Historical Society purchased the house in March 2001. When they purchased the house, they decided to name it after its original residents and its final residents. It became known as the Ennis-Handy House. The Ennis-Handy House joined the Kansas Register of Historic Places May 12, 20014. At the time, the house was missing its extensive spindle work on the front porch and balcony. It was also missing the scrolled gingerbread ornamentation on its gables. Because of the missing pieces, the Kansas Historic Sites Board of Review decided not to nominate the house for the National Historic Register. 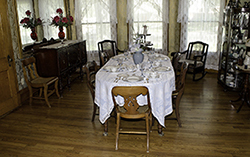 In the summer of 2004, the historical society replicated the missing features. After the society’s work, the house’s exterior appearance became close to its original appearance. On July 12, 2006, the house was listed on the National Register of Historic Places at last. The society also commissioned local Elwyn Vatcher to make a stained glass window in the front staircase in memory of Ruth and Selby Soward. Ruth was longtime editor of the society’s newsletter. The “SCHS” on the window stands for Sherman County Historical Society. The house’s kitchen is now the gift shop. Souvenirs of the Ennis-Handy House and many publications about Sherman County are available. Suggested donation is $5 for adults aged 12-59, $4 for senior citizens and $3 for children aged 2-11. House stands on one of the original brick intersections from 1921. Goodland has two other buildings on the national register: the Post Office and Carnegie Arts Center. In 2008, the house was chosen No. 1 in the Eight Wonders of Sherman County contest.